In 1944 Poland, a Jewish shop keeper named Jakob brings hope to the Jewish ghetto through inventing radio broadcasts of Allied advances and Nazi defeats. A remake of the 1975 German film Jakob, der Lügner which was in turn, based on the book by Jurek Becker. The film stars Robin Williams as Jakob, Hannah Taylor Gordon as Lina (the ten year old girl Jakob is hiding from the Nazis), Liev Schreiber as Mischa, and Alan Arkin as Frankfurter. Unlike the 1975 film (NY Times review), this release was met with poor response from the critics. ...the screenplay and direction are lugubrious, as the characters march in their overwritten and often overacted roles toward a foregone conclusion...I can imagine this material in black and white, grubbier, without stars, with subtitles to spare us the accents. It could work. Maybe I'm actually describing the 1975 East German film, which won the Silver Bear at the Berlin Film Festival. This one played last week in Toronto, where Williams got more applause for walking out on the stage before the screening than the whole movie got afterward. While the support from fellow players Arkin, Schreiber and Siemaszko, as Williams' fellow persecutees, is competent enough, the entire enterprise has been smothered with such a sickly layer of glutinous Hollywood sentimentality - replete with a predictably semi-happy ending - that diabetics should probably consult their doctor before even seeing the trailer. While filmed before "Life is Beautiful" but released afterwards (Williams had two other films that were slated for release before this one), comparisons between the two films were inevitable, as both featured comic actors and humorous takes on the Holocaust. Ebert, in his review, stated that he preferred ""Life is Beautiful" which is clearly a fantasy, to "Jakob the Liar," which is just as contrived and manipulative but pretends it is not. You have to earn the dividends of realism." Bob Graham (SF Chronicle) wrote one of the few positive reviews of the film, saying that "the two films are very different in tone and very different experiences for the audience. Benigni's film was, for better or worse, cute. There is nothing cute in "Jakob the Liar."" 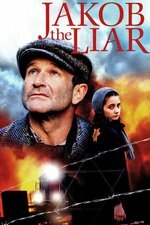 Robin Williams and the Post-Holocaust Schlemiel: "...the question isn’t about whether Robin Williams or Roberto Benigni can accomplish the feat of using comedy, nach Auschwitz, to relate to the Holocaust so much as whether the schlemiel character that they draw on – which is one of the most important stock characters in the Jewish tradition – can or even should exist after the Holocaust." Can Humor Shed Light on the Holocaust? This film is part of the Robin Williams' Movie Club. I wrote one of the few good reviews of this film when it came out. I felt like it was truer to the Holocaust than Life is Beautiful, and had the qualities of a Jewish folk tale, albeit an especially sad one. I found it interesting how split the critical response seems to be - people who like Life is Beautiful don't like Jakob, and vice versa. Perhaps it was because a lot of time had elapsed for me between seeing Life and then this one, but I didn't jump to that comparison immediately, and in all honesty, I'm not sure which one I would prefer to see again.